Shipping a vehicle overseas can demand so much time and effort. Availing the services of a truck shipping company ensures that you get help you with all the necessary paperwork and other legalities to avoid inconveniences and extra costs. At Easy Haul, we provide U.S. and international delivery services and also take care of US customs, loading fees, and port fees on your behalf. Like any other industry, the auto shipping industry has its ‘industry-speak’, which is specific terms and jargon that you must try and know before inviting truck shipping quotes. This post discusses some important terminologies used in the truck shipping industry. Take a look. Enclosed shipping involves transporting vehicles using an enclosed trailer. It is the best option when transporting vintage or high value cars. Truck shipping companies usually charge extra for this service. Open transport involves shipping vehicles in an open trailer, often exposing them to the elements. Open shipping is one of the most affordable ways to transport vehicles and is preferred by many people. Prepare your vehicle by cleaning it, topping up fuel, and maintaining the proper tire pressure to avoid any damages, if you wish to walk down this road. Auto transport brokers act as a bridge between auto transport companies and people looking to ship their vehicles. Brokers are responsible for finding the best deals for their customers and often negotiate with the truck shipping companies to get deals that fit their budgets and meets their requirements. Liaising with federal, state,and local law enforcement bodies to keep a check on accidents involving heavy vehicles. Developing and enforcing safety regulations. Educating the carriers, commercial drivers, and public on safe driving habits. The provider will pick up the vehicle from your location and drop it at the delivery location, if you opt for door-to-door services. 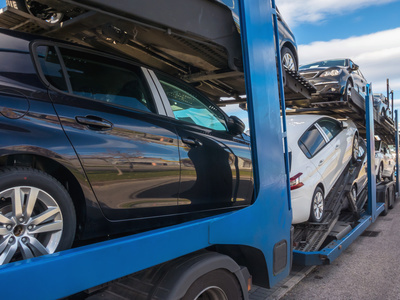 In a terminal-to-terminal arrangement, the auto shipping company will store your vehicle at a terminal until the assigned person picks it up. Knowing these terms helps you negotiate effectively with truck shipping companies when transporting your vehicle and go for the best shipping option. You must also be very careful when selecting your provider and look for a company that has a track record of delivering on its service promises. At EasyHaul, we use sophisticated tracking systems and provide support at every step when shipping your vehicle. This has helped us maintain a solid track record over the years. To learn more about our services or truck shipping rates, fill out our contact form or call us at +1 (360) 597-9320.